Sometimes it doesn't matter how much you scrub and scrub and scrub. There's just no getting that mildew looking substance out of the grout of your tile floor. In fact, unless you have superhuman strength, or simply pull the tiles up, there's nothing you can do by yourself to make that tile look like new again! Elbow grease sometimes won't do the trick, unless you are Lou Ferrigno, and have hulking strength. Even the strongest people will get tired being on their hands and knees all day cleaning tiles with a toothbrush. Therefore for your precise, precious, and utterly profound tile cleaning, give us a call. Your knees, back, and wrists will thank you! 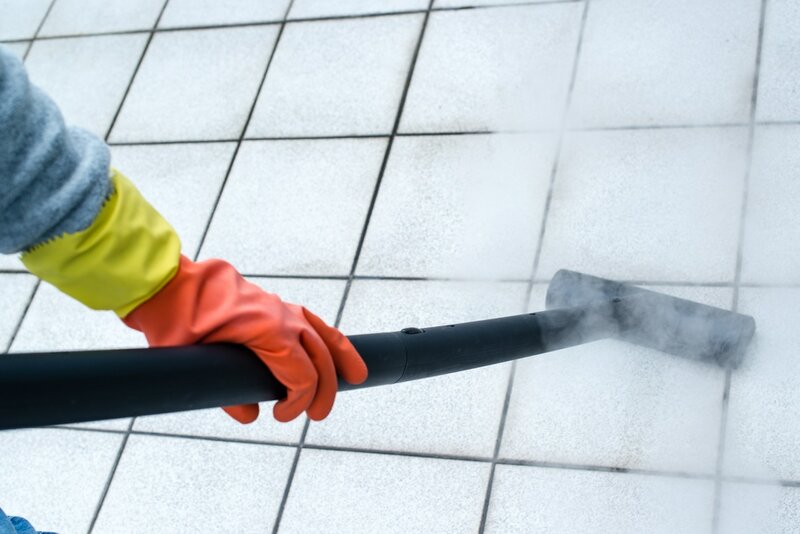 Some carpet cleaning companies offer this service, and while they will clean your tile, they use very damaging chemicals that can discolor your tile and grout, leading to a much worse disaster down the road. Our safe cleaning system not only can make your tile and grout look brand new, but it will insure that the next time you clean it, the shine will come right back. This is something that you will want to do every couple of years, just to make sure that you do not have to replace your unhappy tiles. We also offer a service that most other carpet and tile cleaning companies do not. We can refinish, and reseal your tiles, and even re-color your grout in a different color. Most homeowners think that grout has to be a very light color, often ivory, or bright white. But once we offer to color your grout in a other colors, you will be amazed at how little dirt will show through, therefore giving your kitchen and bathroom floors a much different and refined look. You'll be the talk of the neighborhood after we have a battle with your tile! How much does new tile cost anyway? And how about paying someone to install it? Even if your wallet is a full and plentiful one, why not just ask us about our tile cleaning specials? You'll be ecstatic that you did, and you'll think we just installed the new tile ourselves! Keep your tile looking sparkling, new, fresh, clean, and beautiful. Call Fort Collins Carpet Cleaners today! These tiles will look amazing once our tech is done with them.